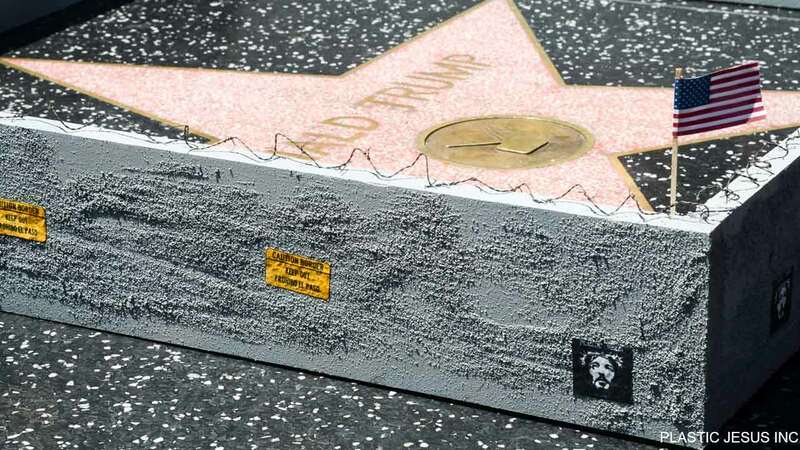 LOS ANGELES -- A street artist built a tiny wall, complete with barbed wire, around Donald Trump's star on the Hollywood Walk of Fame. The 6-inch-tall concrete wall, which features signs reading "Keep Out" and a mini American flag, was constructed by a street artist known as Plastic Jesus. A crowd gathers around a miniature wall built around Donald Trump's Hollywood Walk of Fame. Plastic Jesus is no stranger to expressing opinions about Trump through art. The artist is also responsible for fake "parking" signs that read "No Trump Anytime." The placards were placed outside Trump Tower in Chicago as well as other locations throughout Los Angeles, New York and Washington, D.C. The artist is also known for such works as a heroin-using Oscar statue and "No Kardashian Parking Anytime" signs. The art installations are typically left in place for a short period then removed. The wall was constructed Tuesday - the same day Trump officially became the Republican nominee for president. One of Trump's more controversial proposals is a plan to build a wall between the United States and Mexico to keep out illegal immigrants. Click here for full coverage on the 2016 presidential race.